Nmap does not have an option for saving scan results in HTML, however it is possible to convert XML output to HTML automatically. An Nmap XML output file usually contains a reference to an XSL stylesheet called nmap.xsl that describes how the transformation takes place. 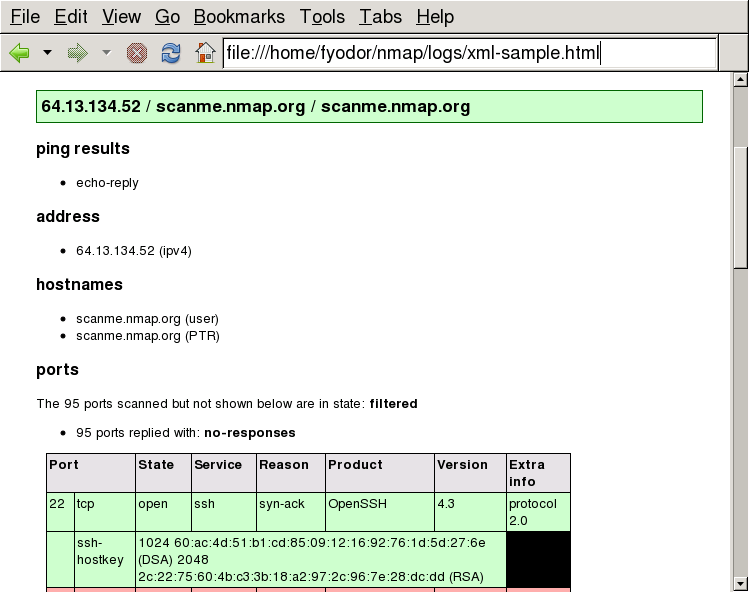 The exact location may be different depending on the platform and how Nmap was configured. The resultant XML output file will render as HTML on any web-connected machine. Using the network location in this fashion is often more useful, but the local copy of nmap.xsl is used by default for privacy reasons. To use a different stylesheet, use the --stylesheet <file> option. Note that --webxml is an alias for --stylesheet http://nmap.org/svn/docs/nmap.xsl. To omit the stylesheet entirely, use the option --no-stylesheet. Here are commands that turn an Nmap XML output file into an HTML file using common XSLT processors. Sample output viewed in a web browser is shown in Figure 13.1, “HTML from XML output in a web browser”. These programs automatically know where to load the stylesheet thanks to the embedded stylesheet reference. As a historical note, the stylesheet was originally intended to render the XML output as HTML by simply opening the XML file in a web browser. For a while it worked that way. But web browsers are implementing more and more severe same-origin restrictions that prevent XML files from loading except from narrowly limited locations. For example, Gecko, the rendering engine used by Mozilla, requires that the stylesheet be located in the same directory as or in a subdirectory of the XML file.